Pacific Northwest farmers have found success growing these bountiful blooms for a thriving global market. But they’re held back by a devastating disease: a fungus called Botrytis. 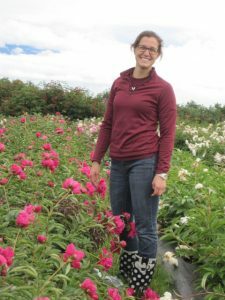 “Diseases caused by Botrytis are the peony’s number one health problem,” said Andrea Garfinkel, a fall 2017 graduate from Washington State University’s Department of Plant Pathology. 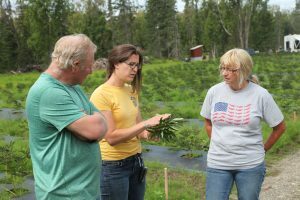 Garfinkel talks with growers about the health of their peonies during a 2016 Alaska field visit. Garfinkel samples peonies in a Netherlands field. She has added nearly a third to the known species of Botrytis, a devastating disease of the popular ornamental. Over the last three years, Garfinkel worked with Holloway and Chastagner to visit growers in Alaska, Washington and Oregon. The researchers sampled diseased specimens at planting time, during the growing season, and when plants went dormant.